The global smart watch market size is growing at a CAGR of 20.7% during the forecast period, reaching USD 46.6 billion by 2024. Smart watches are extensively being used for recording and tracking health considerations for instance body temperature and blood pressure levels. Technological upgradation in smart watches by key players, and increasing demand for wireless health monitoring devices and remote patient monitoring are the major factors that are driving the growth of the smart watch market across the globe. On the basis of product, the smart watch market is segmented into classic, extension and standalone watches. Among all of these products, extension smart watches have been contributing largest revenue and will continue to do so in the coming years. The growth of in demand for this product is attributed towards development of well-equipped smart watches that are extensively being utilized for the extension of smart devices. Moreover, development of innovative devices such as connectivity, tracking and alerts having compatibility with extensive smartwatches is expected to generate massive interest among the users thereby strengthening the growth of smart watch market across the globe. On the basis of operating system, the smart watch market is segmented into android, iOS and others. Among these operating systems, iOS based smart watches hold the largest share in the market. “watchOS” product, launched by Apple is observing tremendous growth since the launch of this product in the market due to innovative technology and its competence. Based on application, the smart watch market is segmented into wellness, medical, personal assistance, sports and others. Among these segments, smartwatches inscribed with features for personal assistance are expected to witness the highest CAGR during the forecast period. Personal assistance on smart watches thereby simplifies the routine activities of the users by analyzing critical information and data that helps the users to become more efficient and productive. The increasing responsiveness pertaining to personal health and fitness is expected to drive the growth of the smart watch market due to the establishment of large numbers of health and fitness monitoring applications worldwide. Moreover, increasing number of smart watches enabled controlled automotive proficiencies is another factor that is driving the growth of smart watch market across the globe. Companies are excessively establishing systems that enable the users to unlock and lock the cars with the use of smart devices and also providing technology to start the car with the help of a remote. There are various smart watches that enable remote start system, connecting the car with a wireless network and remote start technology, this is boosting the demand of smart watches in the automotive domain across the world. Moreover, technological advancement in automotive systems to make it compatible and convenient to use with the help of latest smart watch devices is thereby fueling the growth of smart watch market globally. The inadequate information related to product or services is the major factor that is hampering the growth of global smartwatch market. Also, the shorter battery life of these smart watches is another factor that is expected to further hinder the growth of smart watches market across the globe in the near future. 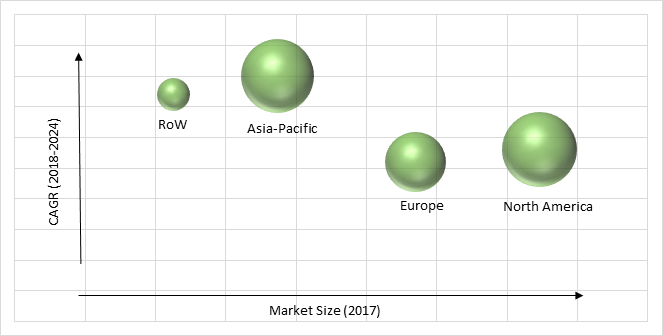 Geographically, smart watch market in Asia-Pacific is expected to witness the highest growth during the forecast period due to the technological advancements and increasing demand for high-end wearable devices. North America hold the major share of the smart watch market and also anticipated to witness significant growth during the forecast period. The growth of smart watch market in this region is attributed towards massive adoption of IoT devices in this region along with advanced mobile technology. The key players in the smartwatch market include Alphabet Inc., Fitbit Inc., Lenovo Group Limited, Sony Corporation, Garmin Ltd., LG Electronics, Samsung Electronics Co. Ltd., ASUSTeK Computer Inc., TomTom International BV, and Apple Inc.
10.7. Samsung Electronics Co. Ltd.
Table 152 Snapshot – Alphabet Inc.
Table 153 Snapshot – Fitbit Inc.
Table 156 Snapshot – Garmin Ltd.
Table 158 Snapshot – Samsung Electronics Co. Ltd.
Table 159 Snapshot – ASUSTeK Computer Inc.
Table 161 Snapshot – Apple Inc.